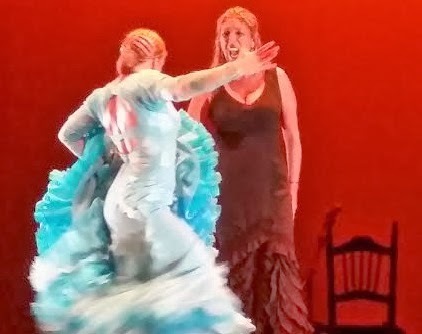 The magnificent city of Córdoba was host to the II International Congress of Flamenco and Cultural Industries Fair of Flamenco on Nov. 14, 15 & 16. 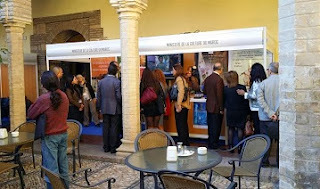 Located in El Palacio de Congresos de Córdoba and adjacent to the magnificent Mezquita Catedral/Mosque de Córdoba, this year's congress was a forum for professionals, artists and cultural stakeholders to share their experiences and expertise with the emphasis on connecting to international Flamenco markets. 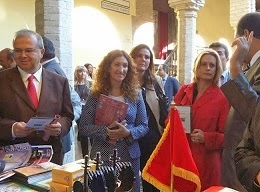 Pictured at left, Deputy Mayor of Culture and Education, Juan Miguel Moreno Calderón, along with the director of the Instituto Andaluz del Flamenco, Mª Ángeles Carrasco, and the General Secretary of Culture of the Ministry of Education, Culture and Sports, Montserrat Reyes welcomed dignitaries at the Moroccan booth as part of the start of an outstanding International Congress on Flamenco, and furthering the unquestionable role of Flamenco as a cultural ambassador for Andalusia. 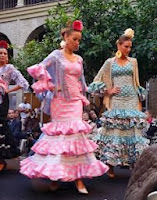 With upwards of 600+ participants and attendees over a three day period for the conference and connected events, the Cultural Industries of Flamenco Fair focused on the cultural and educational aspect of the Andalusian art as an identity - with Córdoba being an epicenter of flamenco, and one of its strongest cultural ambassadors. The aim was to create a meeting place to cultivate dynamic business around the world where Flamenco professionals, developers, public and private entities and other stakeholders could connect, share and develop valuable resources. After the opening, presented by director Maria Ángeles Carrasco, the II International Congress of Flamenco held discussions throughout the day. The morning panel, entitled “Cultural Economy, an Approach to International Cultural Reality,” Chair of Entrepreneurship at the University of Cádiz, José Ruiz Navarro, moderated discussions which involved the Director of the Andalusian Agency for Cultural Institutions, José Francisco Pérez Moreno; the President of the Confederation of Andalusian Flamenco Clubs, Diego Pérez Castillo; the President of the State Federation of Cultural Managers, Alvaro Romero Mena; the Representative of the European Expert Network on Culture, Jordi Baltá Portolés; the Deputy Director of National Institute of Performing Arts and Music, Antonio Herce Garde; and President of the Andalusian Association of Flamenco Entrepreneurs, Pepa Knight. The afternoon panel focused on Economics of Culture and International Markets with the Director of the Bienal de Flamenco de Sevilla, Christopher Ortega, as moderator; the Director of Agrifood and Consumer Area of the Ministry of Economy, Cristian Gross Guille; the Director Flamenco Festival and Flamenco Shows, Miguel Marin; the Director of Suzanne Dellal Centre in Tel Aviv, Yair Vardi; a member of the European Festivals Association and Director of the Estoril Festival, Pineiro Nagy; Director Daniela Lazary from Arte Movimiento; and the CEO of Dell Soluçoes Culturais Art, Steffen Dauelsberg. Many aspects of the industry were discussed, such as the international market for flamenco, grants, sponsorships and patronages, the presence of flamenco in the international media, and the creation of new audiences. In order to reach as many people as possible, the congress was broadcast live via the main web sites of the Ministry of Education, Culture and Sports. Day 2 featured a roundtable focusing on Flamenco in the International Media. Moderated by the press officer of the Ministry of Education, Culture and Sports, Andrés Mellado, participants included RTVA Director, Joaquín Durán; Radio France Culture Director, Cristina Diger; Flamenco por el Mundo Founder and Director Daliris Guitierrez; and Vida Flamenca Productions (Los Angeles) Founder and Director Beth Nesbitt spoke about the expanding Social Media Markets in the United States, Streaming Video on Demand (SVOD) and the expansive market for video product through device-based viewership. Additional panelists included representatives from Flamencoworld.com and Cordobaflamenco.com. The final day of panels included guitarist, Gerardo Núñez; dancer/choreographer, Eva Yerbabuena; moderator, journalist, writer and music producer, José Manuel Gamboa; dancer/choreographer, Andrés Marín; and businesswoman and Director of Ballet Flamenco Yoko Komatsubara (Japan), Yoko Komatsubara. 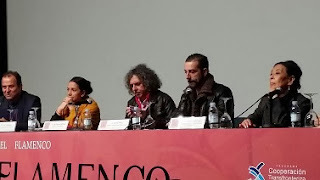 The final roundtable “The World of Flamenco,” which closed the conference, was moderated by flamencologist Faustino Núñez with participants and artists such as Arcángel, Esperanza Fernández, and Diego Carrasco. A special moment featured the universally renowned Flamenco artist Antonio Fernández Díaz, known as "Fosforito." A flamenco singer and winner of the fifth Golden Key of Flamenco, Fosforito is recipient five of such awarded since its inception in 1862. Born in Puente Genil, Cordoba in 1932, into a family of flamenco singers and aficionados, Fosforito is considered one of the twentieth-century’s greatest artists; his encyclopedic repertoire of flamenco song has made him one of the most important pillars of flamenco. 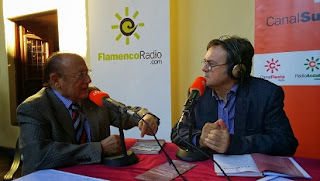 At right, he is being interviewed by Manuel Curao for the on-air broadcast of "Portal Flamenco en Radio Andalucia" on Canal Sur Radio. 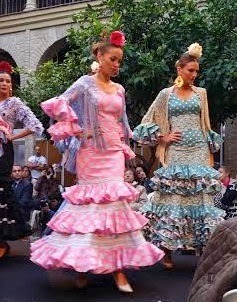 Other Congreso events included a Fashion show in collaboration with the Association of Fashion Designers and Craft Flamenco Andalusia (MOF & ART); a wonderful illustrated video performance entitled “Carmen Amaya: Cien años y un dia de baile” featuring the cante of Moi de Moron and illustrated description by Manuel Curao, and a concert by Jorge Pardo with Josemi Carmona. The grand finale, and representing the eight provinces of Andalucia, a spectacular final show at the Teatro Góngora featuring the cante jondo of Manuel Moreno “El Pele,” Diego Carrasco, Gerardo Núñez, Miguel Angel Cortés, Esperanza Fernández (pictured above right) with Luisa Palicio dancing a spectacular Cantiñas, and the ever amazing performance of Andrés Marín, and Fuensanta La Moneta among others. The show embraced what we ultimately all came together to celebrate - those transcending moments that one experiences in flamenco performance.